Made of woven steel, the highly visible red vinyl protects against scratches, scrapes and deters theft. 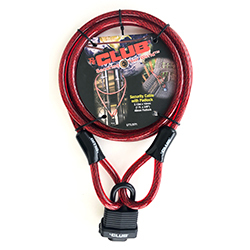 The CLUB Cable Locks and Security Cables are designed to protect a variety of items around the house, garage, farm or job site. The cables are made of heavy-duty woven steel for optimum defense against cutting. The high visibility yellow vinyl cover protects articles from scratches and scrapes and also deters would-be thieves or unauthorized use. They are available in a variety of lengths and locking mechanisms for different applications. Through a combination of design, strength, and utility, these devices offer the best protection available for your valuables.